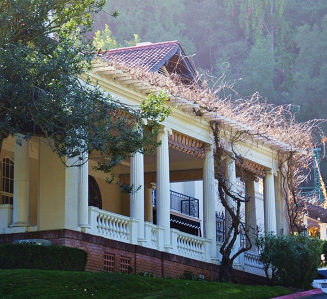 Visit the beautiful grounds at Montalvo Arts Center. Take a hike up the hillside for an amazing view of the valley, or have a picnic on the front lawn. Click here to download a PDF map of the property and trails. NOTE: Dogs are allowed on the upper trails with a leash. The historic Villa is not open to the public except during paid tours, rentals, and other events. NOTE: The park may also close up to 2 hours early for certain concerts and evening events. As you enter the Main Gate you will first arrive at Parking Lot 1 where the Artists Residency is located off to your right. If you are coming to the Villa, Garden Theatre, Carriage House, the Box Office, or to visit the hiking trails behind the Villa, continue through Lot 1 up the road past the Front Lawn. You will see parking lot 2 on the right side of the Villa and lots 3 and 4 on the left side of the Villa. Please drive slowly through the estate, as we have many visitors walking the grounds including children, the elderly, and deer. Click here for directions from Montalvo to West Valley College. Exit at Highway 9 toward Los Gatos/Saratoga. Proceed 3 miles, turning right onto Fruitvale Ave. Turn right on Allendale, then right on Theater Way and park in Lot #1 to your left. Exit south on Highway 85. Exit Saratoga Avenue, making a right turn towards Downtown Saratoga. Continue .3 miles, turning left onto Fruitvale Ave. Continue south on Fruitvale Ave. Turn left on Allendale, then right on Theater Way and park in Lot #1 to your left.